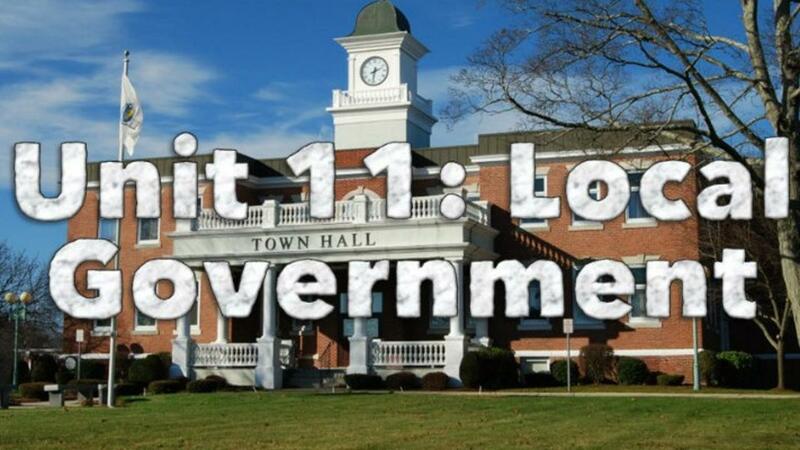 The final unit in our American Government Curriculum covers state and local government. This unit usually covers about 2 weeks but can be longer depending on how in-depth you get into the Service Learning Project that concludes the unit. The unit starts at the state level and progresses down from there to as local as you choose to go in your community. The state government lesson goes over the basics of most state governments, highlighting the role of the governor, state legislatures, courts, etc. Since all states vary slightly, this is a good one to adjust a little if you need to depending on your state. The PowerPoint and guided notes worksheet are both fully editable so that this is a breeze. The next lesson plan covers local governments and also includes an editable PowerPoint and guided notes. There's also a local government simulation and link to a fun online game students can play which simulates the role of municipal government leaders as well. Students also study their own communities in this unit using online census data and other tools to get a better understanding of their community's demographics and government structure. Finally, students complete a neighborhood survey to get a deeper understanding of their own community before planning and enacting a service learning project based on an identified need they found in their community. This is an amazing unit to conclude the year in your Civics class and will leave you and your students inspired! You can sign up for Students of Civics here and start using these resources plus HUNDREDS more for every unit of the year!